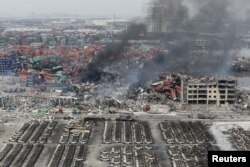 An aerial picture shows smoke rising from the debris among shipping containers at the site of last week's explosions at Binhai new district in Tianjin, China, Aug. 15, 2015. Nearly 100 people are missing, including 85 firefighters. 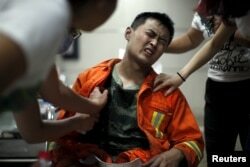 The Beijing News on Saturday said all people within a 3 kilometer radius of the warehouse explosion site are being forcibly evacuated from the area because of a possible chemical contamination. 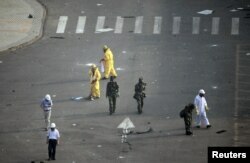 Paramilitary policemen and other rescuers in gas masks examine unknown chemicals on a square near the site of last week's explosions at Binhai new district in Tianjin, China, Aug. 15, 2015. A team of more than 200 military nuclear and biochemical specialists has been searching the area for possible dangerous chemicals.